I love to share Sweepstakes with everyone since its like the free lotto lol. You cant win if you dont enter. I like to enter online sweeps from companies we enjoy their products and its a prize you will like. 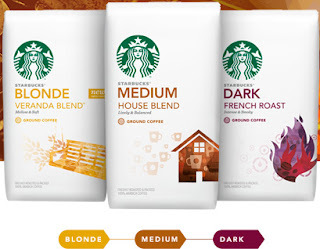 We wanted to share this easy to enter sweepstakes from Starbucks coffee to help introduce the Blonde Roast coffee. Earlier this year, Starbuck launched new that organizes Starbucks coffees by roast – including new Starbucks® Blonde Roast – to make shopping for coffee easier. In addition to Starbucks Medium and Dark Roast coffees, the new Blonde Roast meets the needs of the 54 million coffee drinkers in the U.S. who prefer a lighter-bodied, mellow coffee. Starbucks is excited to announce Starbucks “Find the Roast You Love Most” Sweepstakes to encourage coffee-lovers to explore the full Starbucks Roast Spectrum. Through April 30, customers can enter online to win a trip to Seattle – home of Starbucks – for the winner and three friends, including a personal coffee cupping experience with a Starbucks Coffee Master and coffee-fueled local fun. For more information and to enter, visit: http://starbucks.com/sweeps. *I was not paid for this post. I was provided a sample of Starbucks Blond Roast for free by the company or PR company that represents them. The opinions on this item are 100% mine and may vary from others.